Take this job and shovel it! Meet Yuki-taro, a self-guided, GPS and camera equipped robot snowplow that somehow manages to look as cute as Pokemon's Pikachu - this is Japan, after all! Snow? In Japan? Yes indeed, and not just on top of Mount Fuji. Some parts of northern Japan can receive a surprising amount of snow in wintertime, enough to block roads and isolate people living in mountain villages. Elderly people in particular are at risk in these areas, both from being shut-in and from trying to shovel all the snow. That's where "Yuki-taro, the friendly snowbot", comes in! Though only a prototype at present, Yuki-taro's creators in the snowy city of Niigata expect to have a marketable version ready within 5 years at a cost of under 1 million yen (about $9000). That may sound like a lot, but it's likely that municipalities would pay the cost and deploy them where needed. Besides, Yuki-taro is packed with high-tech features such as a GPS positioning sensor, twin video cameras for obstacle avoidance in the "eyes", and an integral snowblock maker that will thrill local kiddies looking to build an igloo or two! Clears snow, makes igloo bricks - a kid MUST have invented this! Yuki-taro takes in snow at the front, squeezes it into rectangular bricks, and excretes said bricks out the back. Try teaching your dog to do that! The bricks can be easily stacked and stored for summer cooling needs - unless those pesky neighborhood kids get at them first! This sno-jo doesnt solve any problems at all. It only handles loose snow and it only compresses it 8-10 times into solid ice - thats as far as you can go. And it probably spends an outrageous amount of energy doing it. Nothing you cant do manually or with a bob-cat. Its cute, but its a no-go. What good does this really do? What does it do with the ice bricks? Why not just shovel the snow in and melt it to leave only water behind? Kind of silly really. Thanks for your input. The robot was developed with the aim of helping seniors in snowy northern Japan, so shoveling is what the gov't does NOT want them doing. Plus, melting the snow is only half the answer - where does the meltwater go? If it simply freezes on the spot, well, can you say "law suit"? I knew you could! Can it handle a 450' driveway on a hill or do I need two (or three) and can I program it where to 'dump' the bricks? Do you need a beta-test site...cause I've got on in New Hampshire! Check 'em out on my homepage and we'll even take some pics of these critters against the best sunsets around! I think that thomas must be in the snow removeal buisness. I'm going to invent a robotic salt shaker! Then we can race them! This robot is great, and it might serve its purpose to many of us. @Thomas: Your mom is cute, but it's a no-go as well. It's great.. but what we can do with the bricks ? Why did they put eyes on it? In the eskimo magazine it is described as "an easy and fun way to build igloos". It can be bought on credit or bartered for whale meat. $9000? For way less then that, I can hire one of those illegal aliens to shovel my snow, report him in the spring, and have him deported. Then we don't have him sucking up Gov. benefits all summer. There are always plenty of naysayers with anything new - and we've certainly heard from several of them above. Personally, I think it has real, marketable possibilities as-is. In areas which get plenty of snow, for example, the 'bricks' can be stored for later cooling needs. Most of you are too young to recall that, before there were refrigerators, people did store ice blocks in the winter to keep stuff cold in the warmer months....and urban dwellers had Ice Boxes in the home. On a large scale, Supermarkets and charitable Food Banks could save a fortune in refrigeration costs by using these Ice blocks. For a warm-weather variation - it should be possible also to equip this unit with a Mower Deck attachment on the front, for Grass cutting. Think about it! The same technology that allows it to plow the right patch of Snow, would also allow mowing your yard. 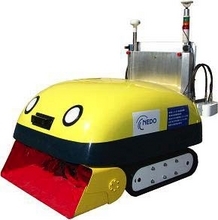 (Think of it as a Roomba Vac for outside the house). Then the grass clippings can be run through the same 'brick making' process - ready to use as Hay for animal feed, in areas where the Hay supply runs short.....OR could be sold to Alternative Fuels processors, to make into Ethanol or Bio fuel alternatives, to run our oil-driven machinery. Wake up and give it some SERIOUS thought, guys! As for me, I'm gonna do some further checking into becoming a Dealer or Distributor for these things. John Snow would have been a better american name for it. We already have John Doe, and John Deer. And to the Desu guy up above. Yea, this machine needs more desu. no, you can use the blocks to create an igloo. because, um, it will freeze over and become a bigger danger than before? that's why you need to scoop snow, so it doesnt partially melt and freeze over, well, part of the reason anyway. Because the water would turn to ice and create a bigger safety hazard. That would be silly.